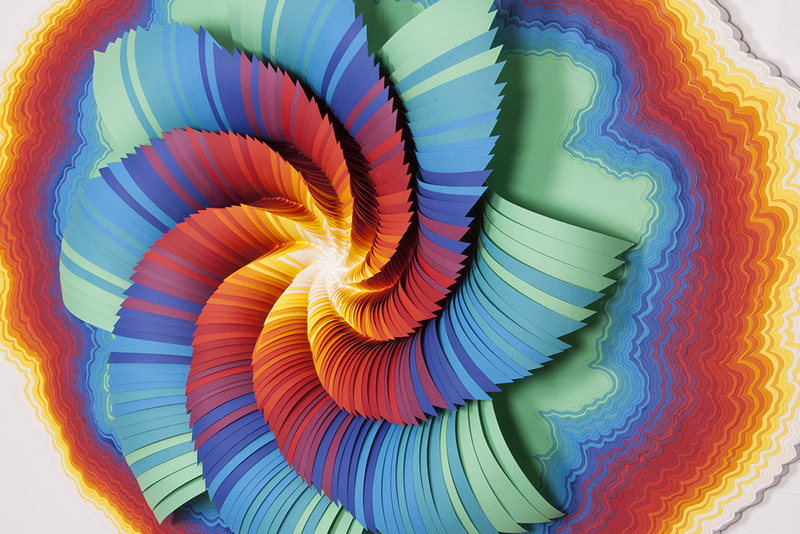 Contemporary artist Jen Stark is a Miami native whose specialty is incredibly intricate paper sculptures. At first glance it is psychedelic, on second take it is brilliant. Inspired by nature and the concepts of replication and infinity, Stark recreates the repetitive patterns with various mediums – paper, wood, and mirrors are all common materials found in her art. Aside from Stark’s hypnotic art featured at Eric Firestone’s gallery as a part of Untitled, the young artist made a huge splash with her teepee project installation at the Mondrian, and kept the party going with Friends with You and Misaki Kawaii as they released a limited edition collection of pool toys at the Soho House. After such a non-stop week, you won’t be surprised to find out she’s chilling in the Keys right now… See below for Jen’s Proust Questionnaire, brought to you by WeTransfer. A nice view, no stress, good friends and family! When I meet someone, I can never remember their names or faces. It takes me at least a few times of meeting them, and makes for some embarrassing moments. Pretty stressed and busy due to Art Basel Miami, but having fun. I can’t think of one virtue that’s overrated. I wish I could have a tan year round. I’m pretty pale. My hubby Alvaro and my art! I think every new moment I am happier than I was before. Life keeps getting better and better. The ability to do amazing high-dives. I’d want to have a Jamaican accent. A large scale art installation I completed last year at Chicago Outlet malls. I created a 20ft x 8ft hanging sculpture, as well as a huge 30ft x 40ft hand painted mural on an escalator in 1 month. Probably would want to come back as an astro physicist or someone who studies the universe. I would finally figure out rhyme and reason to it all. On an island in a hut somewhere far away. My pup Zelda and jewelry from my grandma. Not being able to do what you love everyday. Pretentious people who treat you differently if they think you’re important/famous or not. Not being able to go to my grandpa’s funeral (was overseas studying abroad). He was one of the biggest influencers of me becoming an artist. In little or no pain around loved ones, lucid, and able to say goodbye.